HMS Intrepid (L11) was one of two Fearless-class amphibious warfare ships of the Royal Navy. A Landing Platform Dock (LPD), she served from 1967 until 1999. Based in HM Naval Base, Devonport, Plymouth, Devon and HM Naval Base Portsmouth, she saw service around the world over her 32-year life. 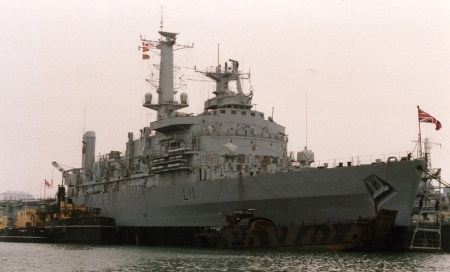 In the process of being decommissioned for sale, she was rapidly returned to service to sail as part of the British operation to retake the Falkland Islands after the Argentine invasion in 1982. She landed troops in amphibious assaults on the Islands and the Argentine surrender was signed on her deck at the conclusion of the Falklands War.